How great and wondrous are the clothes of enlightenment, formless and embracing every treasure. I wish to unfold the Buddha’s teaching that I may help all living things. Redding Zen Buddhist Priory is a place quiet sitting in downtown Redding, CA. It follows the tradition of Serene Reflection Meditation – Soto Zen. awakening the heart of compassion, and expressing it through selfless activity in everyday life. Quiet Meditation. Zen Teaching. Buddhist Practicein downtown Redding. The Priory is a temple of the Order of Buddhist Contemplatives (OBC), an international Buddhist Order, whose North America office is at Shasta Abbey located in Mt. Shasta, California. The Founder of both OBC and Shasta Abbey is Rev. Master Jiyu-Kennett. The Priory was established in 2018. It offers a regular schedule of meditation, Dharma classes, Buddhist services, and retreats, as well as spiritual guidance. It also offers meditation instruction and workshops for beginners. There are no fees for participating in above activities or any other services that the Priory offers. Like other affiliated temples of OBC, the Priory is financially independent; we are supported entirely by donations of our congregation and friends. The Prior of the temple is Rev. Helen Cummings a grand-disciple of Rev. Master Jiyu-Kennett. Rev. Helen trained at Shasta Abbey for 20 years. 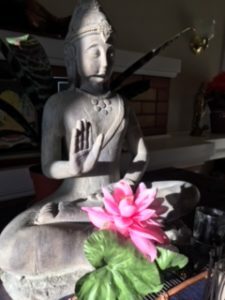 The Order of Buddhist Contemplatives – and the Redding Zen Buddhist Priory – is committed to providing a safe and ethical environment in which all may practice. We expect that we, and those who come through our doors, will treat others preceptually and with respect. We value the harmony of the sangha, and wish to address any concerns that may arise about possible unethical or inappropriate behavior. If you should have such a concern, you should feel free to discuss it with the priest of your or any OBC temple, any senior member of the Order or lay minister. Temple contact information can be found on the OBC website. The Priory exists on the ancient Buddhist tradition of dana, or what we know of as ‘generosity of spirit’, the giving and receiving from heart to heart. The practice of dana dates back 2,500 years to the time of the historical Buddha, Shakyamuni. The Buddha in His wisdom purposely set up a practice of direct interchange and interdependence between the monastic and lay Sangha. He foresaw that reciprocal respect and kindness would develop between members of the Sangha in following the practice of dana, which in turn would assist each one of them in bringing their training to fruition. Generosity makes the heart grow brighter. There is no charge for Priory attending events – meditation, retreats, classes, spiritual guidance, weddings, funerals or memorials. Please keep in mind, though, that we do pay rent for our lovely Priory building and are responsible for the normals costs of running a household. Donations – financial, in-kind, professional services, or help in maintaining the life of the Priory are greatly appreciated.